» Reviewed by Barry Gardner: AARON ELKINS – Old Scores. Reviewed by Barry Gardner: AARON ELKINS – Old Scores. AARON ELKINS – Old Scores. Chris Norgren #3. Scribner’s, hardcover, 1993. Fawcett Gold Medal, paperback, 1994. One thing about Elkins, he picks widely varying specialties for his series characters. Though he’s best known for his “bone doctor” series about Gideon Oliver, the Norgren books seem to be picking up speed. Chris Norgren is curator at the Seattle Art Museum, and who’d have thought the world of acquisitions would be so hazardous? A famous French collector wants to give the museum a Rembrandt — great, hein? Well, maybe. There are a couple of catches: the painting has no provenance, and no scientific tests will be allowed. Chris’s director wants him to go to France and make an accept/reject decision. Chris wants to reject it out of hand, but goes anyway, at the cost of some discombobulation to his already shaky love life. Things are even weirder than expected in France, the situation turns nasty, and murder is done. Well, hell, what did you expect? I don’t believe for a minute that any museum would even consider accepting a master painting without provenance and/or testing, but what do I know about museums? Aside from that, this is the kind of entertaining tale I’ve come to expect from Elkins. I like Norgren as a character, and find the artistic background interesting and edifying. Elkins tells a good story, and creates a good set of supporting characters. His stories fall somewhere between cozy and hard-edged, and while I don’t think anyone would call them memorable, they provide an entertaining read. Editorial Comments: In spite of Barry’s feeling that Elkins’ Chris Norgren series was catching on, this was the third and last of his recorded adventures. As of this month’s publication of The Worst Thing, there are seventeen Gideon Oliver books. Aaron Elkins’ wife Charlotte has been his co-author with five books in their Lee Ofsted series. 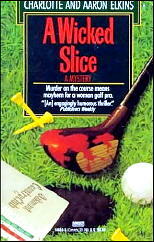 The latter is a lady professional golfer; her first appearance was in A Wicked Slice (1989). I am SUCH A HUGE FAN of Aaron Elkins. I’ve been meaning to feature one of his early books on Forgotten Friday and now you’ve beaten me to the punch! 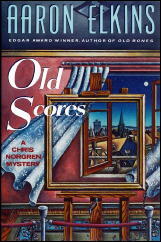 I LOVED the Chris Norgen books and have always wished there were more of them. Just wonderful stuff. My favorite Aaron Elkins book is LOOT. Have you read that one? It’s a stand-alone that also features an art specialist as protagonist. A truly terrific book. I’ve read it several times and each time I love it just as much. Loved to read Barry Gardner’s review! Yvette is right: Aaron Elkins’ LOOT is terrific. No, I haven’t read LOOT, but with two positive comments like this, I really ought to. I don’t know exactly why, but I tend to put aside stand-alones written by authors known more for their series character books, thinking I will read them later, and I seldom do. That said, I’ve never read any of the Norgen books either, though I’ve read quite a few of the Gideon Oliver’s. Maybe if Elkins had written more of them, I would have, but I assume he (Norgren) never quite caught on.